This invasive species was initially found in northeast Florida under a small piece of wood near a retention pond/lake at Baker Skinner Park in southern Duval County, Florida on 7/12/2005 (number 1 on the map). 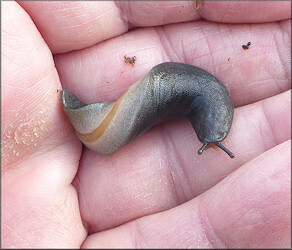 Despite a search of the general area the same date and during many follow-up visits, no additional slugs of any ilk were found. During the next 17 months and hundreds of collecting trips in the county, no further examples of this species were seen. Finally on 1/5/2007 two additional specimens (an adult and a juvenile) were found under a piece of cardboard in a drainage ditch near a Kentucky Fried Chicken restaurant at 10770 Beach Boulevard (number 2 on the map). Additional trips to the same location over the next several months proved that the species was very common at this particular station. Subsequently on 5/18/2007, a specimen was discovered crawling across a sidewalk following rain at a veterinary clinic at 2520 St. Johns Bluff Road (number 3 on the map) - a location about 1 1/2 miles distant from the Kentucky Fried Chicken restaurant. Since that time additional specimens have been found at this location. A preserved specimen from the veterinary clinic has been deposited in the Florida Museum of Natural History in Gainesville, Florida (catalogue number 433948). In an Email of 10/21/2007 Medina Franco, who resides in the Arlington/Ft. 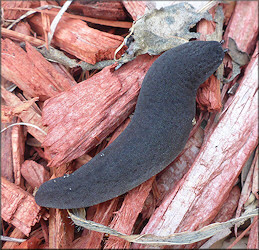 Caroline area of Jacksonville (number 4 on the map), reported finding a specimen of the slug on her back porch - backed up with photographic evidence. Ms. Franco subsequently discovered and photographed a second specimen on the sidewalk in her front yard on 6/9/2008. This location is about seven miles north of the Beach Boulevard find described above. In an Email of 7/29/2009 W. Randall Gallup, who resides in northern Duval County at "The Cape" (number 5 on the map), reported finding two specimens in his yard - also backed up with photographic evidence. During an early morning walk following rain on 9/28/2010, this reporter discovered a large number of specimens (estimated at 50-100) in the roadside swale along Byrnes Road near Jones Creek. The specimens ranged in size from tiny juveniles to full adults. As many of the slugs were paired, this may have represented a mating aggregation. This location is about 1/4 mile west of the location represented by number 6 on the map above. Three preserved specimens from this location were provided to Dr. David Robinson at the Academy of Natural Sciences, Philadelphia, PA.
During a field survey on 10/22/2010, this reporter discovered a single Belocaulus specimen beneath a small log in the roadside swale near the Morocco Shrine Center at 3800 St. Johns Bluff Road South (number 7 on the map). During a field survey on 12/25/2010, this reporter discovered 12 small Belocaulus specimens beneath a landscape timber and mulch bag in a student garden on University of North Florida Drive on the campus of the University of North Florida (number 8 on the map). During a field survey on 12/1/2012, this reporter discovered two small Belocaulus specimens beneath a small board between the Bold City Brewery at 2670 Rosselle Street and the nearby CSX Transportation railroad tracks. A third specimen was found near the same location on 12/4/2012 (number 9 on the map). During a field survey on 3/22/2014, this reporter discovered a Belocaulus population in an empty field on the corner of Mc Coy Creek Boulevard and Broward Road in the core city of Jacksonville (number 11 on the map). Specimens were found on both the east and west sides of Broward Road. During a field survey on 8/23/2014, this reporter discovered a small Belocaulus population near the CSX Transportation railroad crossing on North Pearl Street near West 15th Street in the core city of Jacksonville. The specimens were found beneath a small decomposing palm log along the railroad tracks (number 12 on the map). To the best of our knowledge, these discoveries represent the first time that this species has officially been recorded from northeast Florida. The species was originally described from Paraguay and first detected in the United States (Mobile AL, and New Orleans LA) in 1960 (Dundee and Watt, 1961). The species has been found in Florida since at least the early 1980's. Dundee, D. S. and P. Watt, 1961. Louisiana land snails with new records. The Nautilus 75(2): 79-83. Oct).